For thousands of years and across countless cultures, calligraphy, the art of beautiful writing, has been both a delight to the eye and an inspiration for the spirit. The process of creating a piece of calligraphy is like an experience of ‘celestial dance’ on paper… where you dip the pen in the inkpot, pause to take a deep breath and then put all your concentration on creating a visual masterpiece. This art is about preciseness and dynamic beauty of the strokes. It trains not only your eye and hand, but your mind as well. In today’s fast paced life, calligraphy is truly meditation in movement. In the workshop, Aiyana will guide us, step-by-step, in the discipline and rhythm of creating the 26 alphabets of the English script, using the treasure tools of calligraphy – the oblique nib reed pen, ink and paper. The workshop will be followed by the screening of a film on calligraphy, Tears of Dancing Letters. 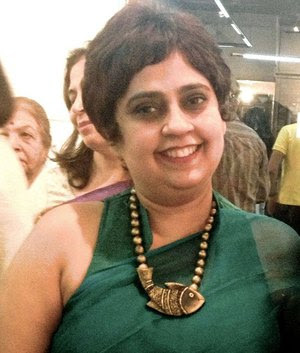 Aiyana Gunjan is a calligrapher/artist, who has been practicing calligraphy for more than a decade. Her exploration into the spiritual dimension and abstract expression of the calligraphy letters has taken a distinct direction. With her ingenious creative mind, she has brought the ancient traditional form of calligraphy into the universal language of contemporary art. Aiyana has also participated in several international exhibitions in India and abroad.